Real-life RoboCop Taking Shape #robotics « Adafruit Industries – Makers, hackers, artists, designers and engineers! Discovery News has an interesting story about this cool looking robot prototype. RoboCop may be blasting his way into theaters this week, but in reality, a cyborg like him is probably still 100 years away from patrolling our streets. But don’t tell that to this team of undergrads from Florida International University’s Discovery Lab. They’re already hard at work on a real-life RoboCop. Granted, it’s nowhere near as advanced as the tech depicted in the movie, but their “Telebot” is nothing to ignore. 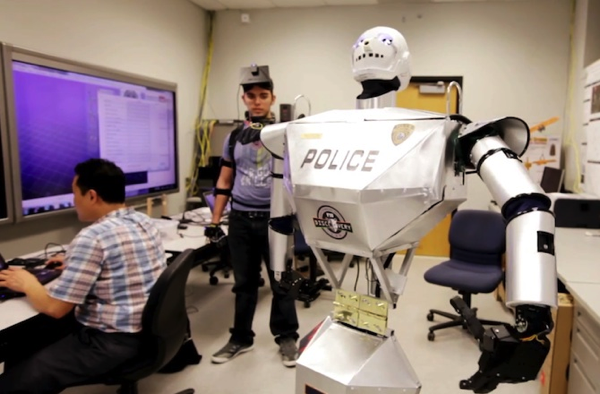 The six-foot tall, 75-pound prototype combines telepresence and robotics to eventually allow disabled police officers and military personal to serve as patrol officers. Built from scratch, Telebot functions via an Oculus Rift headset, a motion-tracking vest, arm bands and gloves — all worn by a remote person. The headset gives that person a live-feed of the robot’s field of vision while the vest relays movements to the robot. The motion-sensing gloves control robot’s hands. The Telebot was made possible by Jeremy Robins, a lieutenant in the U.S. Navy, who donated $20,000 towards the project to help his disabled veteran friends get back into the work force.